I love discovering new home decor inspirations and I hit the mother-load when I found today's feature shop. 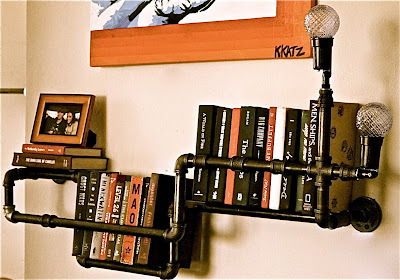 Stella Bleu Designs Industrial Decor on Etsy is a shop that is filled with amazing pieces of wall art designed from industrial pipe and other components to create interesting lighting ideas and book shelves to die for. From pipe sconces to coat racks, bookshelves and more, this shop has revolutionized the modern industrial style of home decor and if you're looking for a unique and interesting fixture to incorporate into your home decor, this is a shop you won't want to miss stopping by to check out. The artist, K Katz, also offers the option of custom designs and loves working with her customers to create something to fit their unique needs. Also included in this shop are a handful of unique original works of art with a definitive influence of The Blues and blue grass behind their inspiration and creation. YOU CAN CLICK ON THE PICTURE ABOVE TO VISIT STELLABLEUDESIGNS ON ETSY AND TAKE A LOOK AROUND OR, IF YOU PREFER, YOU CAN CLICK RIGHT HERE. It's an amazing piece of work! Such creativity!